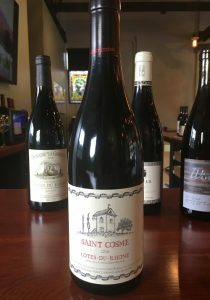 2016 Saint Cosme, Côtes-du-Rhône Rouge, Rhone Valley, France. One of my all time favorite go to wines for any occasion is Louis Barruol’s 100% Syrah Côtes-du-Rhône, it’s a Southern Rhone negociant bottling that uniquely favors Syrah over Grenache, but that is seriously quaffable and offers a depth that way over performs for the price. I loved the up scale version Deux Albion, but at this price, this wine is serious good and authentic in style with a touch of garrigue, anise, leather and is loaded with pure fruit, obviously from a great vintage in the Rhone, it will continue to please for many years, though I find it nearly perfect now and guiltless. Barruol’s Saint Cosme Côtes-du-Rhône, comes from Vinsobres and the Villafranchian terraces of the Gard department, with limestone, sand, red clay and pebbly soils, it was partial whole cluster and partial de-stemmed which was fermented and raised in tank. The 2016 vintage, coming after a great 2015 is from smaller yields, ripe fruit, but with a touch more fresh acidity that should actually help make it stand out and age a little longer, if fact I love it right now. Barruol notes also, that he had have seen two vintages of such a high standard in succession (and I hear 2017 is just as good!). The 2016 may even prove to be better over time because yields were lower, as mentioned above, than in 2015. he adds, and it’s worth repeating many times that the Côtes-du-Rhône wine zones, especially Saint Cosme’s, are an extraordinary winemaking playground, and great for those who like quality at a value price. As the region combines old vines, magnificent terroirs, fairly low yields and an outstanding climate, as is perfectly clear here in (his) Saint Cosme Côtes-du-Rhône Rouge. This 2016 version starts with a nose of spice, herbs, wild flowers, red berry and cassis before entering the medium/full palate with layers of boysenberry, sweet plum and kirsch along with garrigue, a hint of stems, peppercorns, melted salty, black licorice and lingering with tangy blueberry and a mix of lavender and violets, adding a touch of dusty/earth, embers and framboise. There is a ripe sense of tannin and grip that begs for food, but it’s wonderfully easy and hedonistic, it’s hard to imagine a better deal on such a tasty wine, drink this over the next year or two, and keep an eye out for the 2017 which just now available. This Cotes du Rhone, while all Syrah still has a feel of the warm southern Rhone and reflects the Mediterranean sun and influence, it’s impossible to sip on this wine without a huge grin ear to ear.